Chris Dunne looks at Amazon BSR: what it is, where it can be found, how it is calculated, the Best Seller badge, boosting your BSR and more. This post is by Chris Dunne, Marketing Executive at RepricerExpress. 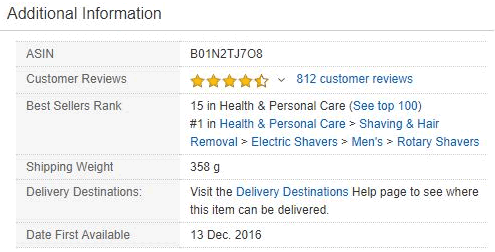 This post will examine an intriguing and often confused metric, Amazon Best Sellers Rank (BSR). Many sellers think that getting the best possible Best Sellers Rank is the aim of the game when selling on Amazon. It’s a clear indication that you’ve beaten your competitors and sales are coming in fast, isn’t it? In this post you’ll discover the truth about BSR, including why it matters and when it doesn’t, how it is calculated, and what you can do to boost it. What is the Amazon Best Sellers Rank? Amazon allocates every product in its multi-million product catalog a number called the Best Seller Rank or BSR, formerly known as Sales Rank. The Best Sellers Rank is calculated based on the number of recent sales while also considering historical sales data for a specific product. The BSR is updated hourly and ranks every product within each of their categories and subcategories. The lower the number, the better the rank. It’s important to note that the BSR of a product is independent across different Amazon marketplaces. For example, you could be ranked in the top 10 of a subcategory on Amazon.com but outside of the top 100 on Amazon.co.uk. A product’s overall BSR shows how well it is selling compared to every other product on Amazon, but given the size and variety of the Amazon marketplace it doesn’t really illustrate how well it is selling compared to similar products. That’s where the category and subcategory best seller lists come in, and for that reason these are generally a much more useful tool. Where can I find a product’s Best Seller Rank? A product’s BSR can be found on the product details section of an Amazon listing. Amazon shows a few of the most popular subcategories in which the item has a high ranking in relation to other items in that subcategory. Each category also has an Amazon Best Sellers page where customers can see the most popular products for that category based on sales. The one below is taken from the Health & Personal Care department on Amazon.co.uk. Products in the top five like these will be experiencing incredible sales. How is Amazon Best Sellers Rank calculated? Amazon does not make the formula for calculating BSR public, so we can’t know exactly how those two factors are weighted, but we do have a good sense of what is involved. These elements can certainly impact whether someone buys your product or not, but your sales rate is the only variable Amazon uses to calculate BSR. BSR weighs recent sales more heavily than historical sales. A product that has had a recent spike in sales will usually have a higher BSR than a product with slow sales. Historical sales still matter though, so an established product with solid sales over time will also have a good BSR, even if recent sales are fairly flat. Newer products are more prone to large BSR fluctuations than established listings, as historical sales data is not available. New products will often jump up and down in BSR due to wide variations in recent sales. Conversely, the longer your product has been listed on Amazon, the harder it will be to affect its BSR with a short-term spike in sales. Sales do not have an immediate impact on your BSR. There is a lag time of approximately 1-3 hours (depending on the popularity of the product) from when a sale is made and when it is reflected in Amazon’s BSR. To get an accurate sense of your average Best Sellers Rank, you should record your ranking over a long period of time. How can you boost your product’s Amazon BSR? If you want to boost your listing’s BSR, you need to increase sales. To do this you should sell a consistently high-quality product and keep it in stock at all times. Running out of stock will send sales to zero and put a big gap in your sales history. Product reviews are also a big factor in building consumer trust and improving sale conversions. Price is an important search ranking factor on Amazon. Products priced competitively appear higher in search results. To keep sales coming in, your products should always be well priced compared to competitors selling similar products. Many sellers use automated repricing software to do this. Product promotions can also help to boost sales and therefore your BSR. You can often see this at work, where a product on promotion in a specific category will start to climb the best sellers chart. This camelcamelcamel.com chart shows a steep BSR climb for a product with regular price drops in the last 2 months. However, some FBA sellers have reported that when they offered a product at a discount their BSR did not increase at the rate they expected. Amazon’s algorithm may be taking promotional giveaways into consideration, and scaling down the impact on BSR when it is due to aggressive discounting. Does BSR always change with an increase in sales? BSR is relative to other products in the category, so an increase in sales won’t necessarily mean an improved BSR. If your product’s sales have increased, but so have the sales for competing products in your category, then your BSR may not improve. Similarly, if your product is ranked #1 and sales remain steady, your Best Sellers Rank may drop if competitors start selling more than you. In some categories there are millions of products, so the BSR will range into the millions also. It can be near-impossible to to break into double or single-digit BSRs in those categories. Some sellers will select only their product’s least competitive category to track, and try to get a bestseller in that category alone. This strategy often makes sense, but don’t be tempted to choose an inappropriate category for your product to improve your chances of getting a bestseller, as that would be a violation of Amazon’s Product detail page rules. How important is Amazon Best Sellers Rank? BSR can be useful as an indicator of your product’s overall sales health, but it is unlikely to have any direct impact on a customer’s decision to buy. For this reason, you might see BSR as a vanity metric that sellers shouldn’t get too hung up on. Monitor it, by all means, but don’t make it a goal in itself. Organic search ranking for relevant keywords. Quantity and quality of product reviews. To look at it another way, improving the metrics above can impact sales while BSR can help show the end result of all those efforts. How does Best Sellers Rank help in product sourcing? Sellers can use BSR to see how they’re measuring up against their competitors, but it’s also valuable for product research. How they are selling relative to other products in their category. The success of price promotions, review campaigns etc. How many units they are selling each month. Estimating the number of units sold requires some baseline data on the sales volume for various BSR points in the same category. But remember that BSR is a relative ranking of products, including both recent and historical sales, so estimating sales volume this way will only provide a rough guide to sales. You can also find sales estimation tools in the Web Retailer directory, which use data including BSR to provide their estimates. What is Amazon’s #1 Best Seller badge? Every Amazon seller would love to see their product labeled as number one. Having a small orange #1 Best Seller badge on your product listings can mean more clicks, improved sales and a better reputation. The Best Seller badge simply means that the product has a BSR of one. In other words, it is at the top of the Best Sellers chart for its main category. While BSR in general is unlikely to influence sales, being the #1 Best Seller is a big deal and provides a lot of social proof that your product is the best. Having said that, getting to this position is way out of reach for the majority of sellers and unlikely to be a sensible goal in itself. Note that this is a completely different badge from Amazon’s Choice. What’s the difference between Best Seller Rank and search rank? Search rank is the position of your product in Amazon’s search results for a specific search term. BSR is an indication of product sales, relative to other products in the same category. They are both ranks – positions within a list – but are otherwise completely different. Your product’s BSR will not correlate with where you rank in search for a specific keyword. A product with a great BSR could appear way down in Amazon’s organic search results while a product with a poor BSR could rank highly. Amazon Best Sellers Rank is an ever-changing metric which can fluctuate quite a bit throughout the day, week or month. Search ranking is less volatile than BSR, but affected by many more variables such as listing content, pricing, reviews and sales. Search is the main way customers look for products on Amazon, so, in general, sellers should pay more attention to where their product appears in organic search results than its BSR. BSR is an indicator of how well a product has sold. BSR is recalculated every hour for every product. There is a lag time of around 1-3 hours between making a sale and that reflecting in your BSR. Amazon does not make its best sellers algorithm public. Sales are the only factor that directly affects BSR. Recent sales are more heavily weighted in Amazon’s BSR algorithm, but historical sales still hold considerable weight. BSR is prone to fluctuations. Amazon BSR and search ranking are two separate metrics. As BSR can be such a volatile metric, it should be treated with caution. To get an accurate picture of a product’s BSR, you need to track it over a long period of time. If you only use a snapshot, it is like a coach trying to analyze a football game by only seeing a few seconds of play. It’s up to you how much importance you want to place on Amazon BSR but as search is the number one way people find products on the marketplace, optimizing your listing is likely to be a smarter use of your time. Amazon doesn’t make the BSR formula publicly available, so it’s difficult to define with any certainty what the algorithm includes. The above is what I have found in my research and no doubt some of you will disagree! Feel free to add your thoughts in the comments below. But, I’m sure we can all agree that the more we understand about Amazon and its algorithms, the better equipped we will be to sell successfully on the marketplace. This post was by Chris Dunne, Marketing Executive at RepricerExpress. RepricerExpress is an Amazon and eBay auto-repricing tool that optimizes profit margins and keeps sellers competitively priced 24/7. Hi Chris, thanks for the great blog.